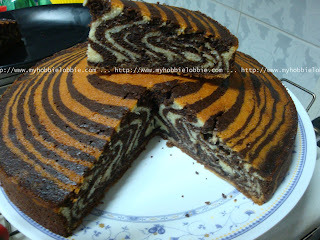 This week, you're in for a visual treat - my first attempt at a zebra cake. I fell in love with these stripes ever since I first saw them. However, months passed till I actually got down to making this beauty. The cake was simple to make. I was a little anxious during the process, but was very happy with the end result. This cake does not use butter. I'll be honest, I'm not a big fan of cakes without butter - I'm not too crazy about the taste. However, I read in a few places that this cake is all about the consistency of the batter and since this was my first time trying it, I didn't want to experiment. I stuck with the original recipe and now that I know what to expect, I'm going to experiment with my tried and tested (not to mention - much loved) sponge cake recipe. If you like the way it looks, you should try it out sometime. You'll be amazed at how simple it is. Once you've tried it out, you can switch the recipe if you wish to. Have fun! Grease and line the cake pan and keep aside. Cream the eggs and sugar till light and fluffly. Add the milk, vanilla extract and oil and continue beat till it is well combined. In another bowl, sift the flour and the baking powder. Gradually add the dry ingredients to the wet ones, mixing till incorporated. Do not overbeat. Divide the batter into 2 equal portions. Keep one as it is and add the cocoa powder to the other and mix well. To assemble the cake, remember that you need to work quickly. Start by spooning 3 heaped tbsp of the plain batter in the middle of the prepared cake pan. Then spoon the same amount of cocoa batter over this batter in the middle. DO NOT TILT OR TWIRL THE PAN. JUST KEEP SPOONING THE BATTER ONE OVER THE OTHER ALTERNATING THEM. The batter will spread out on its own. Don't try to help it do that or you'll interfere with the lines. Continue till all the batter is done. Carefully place the pan in the oven, trying not to disturb the layers. Bake for about 40 minutes or till done. Remove from the oven and take the cake out of the pan and transfer to a wire rack to cool. You'll have yourself a gorgeous looking cake. Stand back and admire. NOTE - For step-by-step pictures stop by AZ Cookbook. 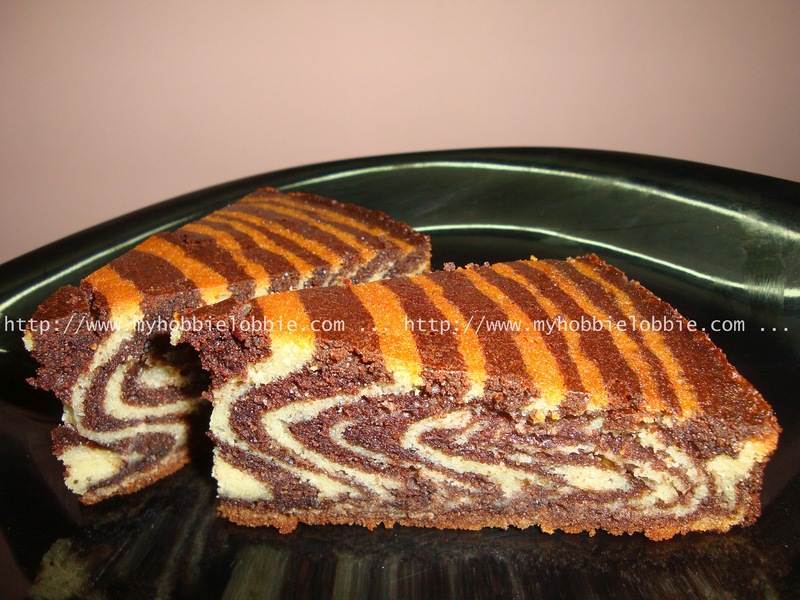 Delicious and irristibly tempting zebra cake. How fun! I've never seen these before. I can't wait to try one. I've always wanted to make this cake but was a little afraid how it would turn out. I love that zebra effect. I will be interested to know how other cake recipes work in this technique. I was a little apprehensive too. But I'm glad it worked out. I guess other recipes would work well, provided its a reasonably thin batter. Amazing cake, it looks fantastic. I would definately like to try this out. Thanks for posting it. Hii ,can I make cake without egg ,?what will be alternate ? I haven't tried it without egg. But you can try any eggless cake recipe, but the batter has to be more fluid than a regular cake batter. If the batter is too thick you wont get the stripes to ribbon out.